"Alpine (car)" redirects here. For the Sunbeam car model, see Sunbeam Alpine. For the Chrysler car model, see Simca 1307. The Société des Automobiles Alpine SAS, commonly known as Alpine (French pronunciation: ​[alpin(ə)]), is a French manufacturer of racing and sports cars established in 1955. The Alpine car marque was created in 1954. Jean Rédélé, the founder of Alpine, was originally a Dieppe garage proprietor who began to achieve success in motorsport with one of the few French cars that were produced just after the Second World War, the Renault 4CV. The company has been closely related to Renault through its history, and was bought by it in 1973. Production of Alpine models ceased in 1995. The Alpine marque was relaunched with the 2017 introduction of the new Alpine A110. Using Renault 4CVs, Rédélé gained class wins in a number of major events, including the Mille Miglia and Coupe des Alpes. As his experience with the little 4CV built up, he incorporated many modifications, including for example, special five-speed gearboxes replacing the original three-speed unit. To provide a lighter car he built a number of special versions with lightweight aluminium bodies: he drove in these at Le Mans and Sebring with some success in the early 1950s. Encouraged by the development of these cars and consequent customer demand, he created the Alpine marque in 1954. It was named "Alpine" after his Coupe des Alpes successes. He did not realise that in England the previous year, Sunbeam had introduced a sports coupe derived from the Sunbeam Talbot and called the "Sunbeam Alpine". This naming issue was to cause problems for Alpine throughout its history. In 1955, he worked with the Chappe brothers to be amongst the pioneers of auto glassfibre construction and produced a small coupe, based on 4CV mechanicals, called the Alpine A106. It used the platform chassis of the original Renault 4CV. The A106 achieved a number of successes through the 1950s and was joined by a low and stylish cabriolet. Styling for this car was contracted to the Italian designer Giovanni Michelotti. Under the glassfibre body was a very stiff chassis based on a central tubular backbone which was to be the hallmark of all Alpines. Alpine then took the Michelotti cabriolet design and developed a 2+2 closed coupe (or 'berlinette') body for it: this became the Alpine A108, now featuring the Dauphine Gordini 845 cc engine, which on later models was bored out to give a capacity of 904 cc or (subsequently) 998 cc. The A108 was built between 1958 and 1963. By now the car's mechanicals were beginning to show their age in Europe. Alpine was already working closely with Renault and when the Renault R8 saloon was introduced in 1962, Alpine redeveloped their chassis and made a number of minor body changes to allow the use of R8 mechanicals. 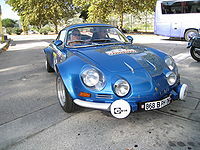 This new car was the A110 Berlinette Tour de France, named after a successful run with the Alpine A108 in the 1962 event. Starting with a 956 cc engine of 51 bhp (38 kW), the same chassis and body developed with relatively minor changes over the years to the stage where, by 1974, the little cars were handling 1800 cc engines developing 180 bhp (134 kW)+. With a competition weight for the car of around 620 kg (1,367 lb), the performance was excellent. Alpine achieved increasing success in rallying, and by 1968 had been allocated the whole Renault competition budget. The close collaboration allowed Alpines to be sold and maintained in France by normal Renault dealerships. Real top level success started in 1968 with outright wins in the Coupe des Alpes and other international events. By this time the competition cars were fitted with 1440 cc engines derived from the Renault R8 Gordini. Competition successes became numerous, helped since Alpine were the first company fully to exploit the competition parts homologation rules. 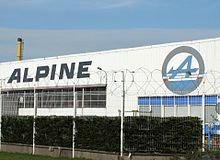 In 1969, Alpine opened a new assembly plant in Dieppe. In 1971, Alpines finished first, second and fourth in the Monte Carlo rally, using cars with engines derived from the Renault 16. In 1973, the newer A110 1800 finished first, second, third, and fifth and went on to win the World Rally Championship outright, beating Porsche, Lancia and Ford. During this time, production of the Alpine A110 increased and manufacturing deals were struck for A110s and A108s with factories in a number of other countries including Spain, Mexico, Brazil and Bulgaria. With 1973 came the international petrol crisis, which had profound effects on many specialist car manufacturers worldwide. From a total Alpine production of 1421 in 1972, the numbers of cars sold dropped to 957 in 1974 and the company was bailed out via a takeover by Renault. 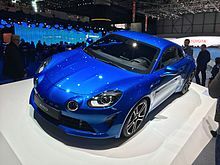 Alpine's problems had been compounded by the need for them to develop a replacement for the A110 and launch the car just when European petrol prices leapt through the roof. 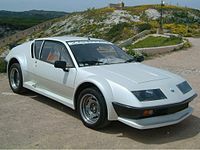 Through the 1970s, Alpine continued to campaign the A110, and later the Alpine A310 replacement car. However, to compete with Alpine's success, other manufacturers developed increasingly special cars, notably the Lancia Stratos which was based closely on the A110's size and rear-engined concept, though incorporating a Ferrari engine. Alpine's own cars, still based on the 1962 design and using a surprising number of production parts, became increasingly uncompetitive. In 1974 Alpine built a series of factory racing Renault 17 Gordinis (one driven by Jean-Luc Thérier) that won the Press on Regardless World Rally Championship round in Michigan, US. In fact, having achieved the rally championship, and with Renault money now fully behind them, Alpine had set their sights on a new target. The next aim was to win at Le Mans. Renault had also taken over the Gordini tuning firm and merged the two to form Renault Sport. A number of increasingly successful sports racing cars appeared, culminating in the 1978 Le Mans win with the Renault Alpine A442B. This was fitted with a turbo-charged engine; Alpine had been the first company to run in and win an international rally with a turbo car as far back as 1972 when Thérier took a specially modified A110 to victory on the Critérium des Cévennes. 1971 also saw Alpine begin construction of open-wheel racing cars. Initially in Formula Three within a year they were building Formula Two cars as well. However, without a competitive Renault Formula Two engine available, the F2 cars could neither be known as Renaults nor Alpines while powered by Ford-Cosworth and BMW engines and were labelled Elf 2 and later Elf 2J. A Renault 2.0 litre engine arrived in time for Jean-Pierre Jabouille to win the European Formula 2 Championship in 1976. By this time Alpine with Jabouille driving had built a Formula One car as a testing mule which lead directly to their entry into the Formula One World Championship in 1977. A second European Formula 2 championship followed with René Arnoux in 1977 with the customer Martini team, before Alpine sold the F2 operation to Willi Kauhsen to concentrate on the Le Mans and Formula One programs. In 1987 the installation of anti-pollution systems allowed the V6 turbo to be distributed to Switzerland, Germany, Austria and the Netherlands. 1989 saw the launch of the limited edition GTA Mille Miles to celebrate Alpine's 35th anniversary. Production was limited to 100 cars, all fitted with ABS braking, polished wheels, special leather interior and paintwork. This version was not available in RHD. 1990 saw the launch of the special edition wide-bodied GTA Le Mans. Otherwise identical mechanically to the V6 Turbo, the engine was fitted with a catalytic converter and power was reduced to 185 bhp (138 kW). This model was available in the UK and RHD versions carried a numbered plaque on the dashboard. The Le Mans is the most collectable and valuable GTA derivative, since only 325 were made (299 LHD and 26 RHD). These were available from Renault dealers in the UK and the country's motoring press are belatedly recognising the GTA series as the 'great unsung supercar of the 1980s'. The last Alpine, an A610, rolled off the Dieppe line on 7 April 1995, Renault abandoning the Alpine name. This was always a problem in the UK market. Alpines could not be sold in the UK under their own name because Sunbeam owned the trade mark (because of the mid-50s Sunbeam Alpine Mk I). In the 1970s, for example Dieppe were building modified Renault 5s for the worldwide market. The rest of the world knew them as R5 Alpines but in the UK they had to be renamed to R5 Gordini. With the numerous company takeovers that have occurred, it is another French company, PSA Peugeot Citroën, who now own the British Alpine trademark. The Alpine factory in Dieppe continued to expand; in the 1980s they built the special R5 Turbo cars, following the rear engined formula they have always used. They built all Clio Williams and RenaultSport Spiders. The factory put its Alpine badges on the early batches of the mid-engined Clio series one Clio V6. The Clio Series 2 was also assembled there with more recent RenaultSport Clio 172 and RenaultSport Clio 182s. Between 1989 and 1995, a new Alpine named the A710 "Berlinette 2", was designed and two prototypes were built. Due to the cost of the project (600 millions francs), and as adding modern equipment and interior would compromise the price and performances, the project was canceled. The Dieppe factory is known as the producer of Renault Sport models that are sold worldwide. This was originally the "Alpine" factory that Renault took over when they acquired the brand in 1973. Some of the Renault Sport models produced in Dieppe are currently the Mégane Renault Sport, Clio Renault Sport and the new Mégane Renault Sport dCi is to be built on Renault's Dieppe assembly line. All the RenaultSport track-, tarmac- and gravel-racing Meganes and Clios are also made in the Dieppe factory. In October 2007, it was reported that Renault's marketing boss Patrick Blain had revealed that there were plans for several sports cars in Renault's future lineup, but stressed that the first model would not arrive until after 2010. Blain confirmed that Renault was unlikely to pick a new name for its future sports car and would probably go with Alpine to brand it. Blain described it as being a “radical sports car” and not just a sports version of a regular model. The new Alpine sports car was to have a version of the Nissan GT-R's Premium Midship platform. In France there is a large network of Alpine enthusiasts clubs. Clubs exist in many countries including the UK, USA, Australia, and Japan. In February 2009, Renault confirmed that plans to revive the Alpine brand have been frozen as a direct result of the 2008–2009 global financial crisis and recession. In November 2012, Renault and Caterham Cars announced the purchasing by the latter of a 50% stake in the Renault's wholly owned subsidiary Société des Automobiles Alpine to create a joint venture (Société des Automobiles Alpine Caterham or SAAC) owned equally by both parts, with the aim of developing affordable sport cars under the Alpine (for Renault) and Caterham (for Caterham Cars) brands, which would be available in 2016. In this partnership, Caterham acquired 50% ownership of the Renault's Dieppe assembly plant assets. On 10 June 2014, Renault announced it would be repurchasing the stake from Caterham Cars in SAAC, renaming it Société des Automobiles Alpine. During 2015, two new Alpine concepts were introduced: the Alpine Celebration, unveiled at the Le Mans race weekend, and the CGI-created Alpine Vision Gran Turismo. In February 2016, at an event held in Monte Carlo, Groupe Renault's chief Carlos Ghosn unveiled the Alpine Vision showcar (a model close to the planned production Alpine) and announced a 2017 relaunch for the Alpine marque. The Vision was later presented at the 86th Geneva Motor Show by Alpine. The production version is to reuse the A110 name and the first official pictures were revealed on 28 February 2017 prior to the unveiling at the 87th Geneva Motor show. In 2013, as part of the promotional activities for the launching of Alpine roadcars, Renault partnered with Signatech to enter a Nissan-powered, Oreca-built prototype into the European Le Mans Series championship's LMP2 class. Signatech-Alpine won the team championship. They returned for the 2014 season. 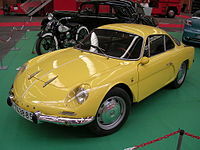 The Renault Alpine 108 was produced in Brazil from 1962 to 1966, under license by Willys-Overland do Brasil, branded "Willys Interlagos". It was the first Brazilian sports car. Bulgaria produced its own version of the Renault Alpine, known as Bulgaralpine from 1967 to 1969. About 150 vehicles were produced. A few examples of the Alpine GTA were imported into the Canadian province of Quebec, with the expectation that AMC/Renault would be adding the model to their Canadian lineup. The GTA was designed by Renault to meet North American standards, however plans to import the GTA to North America were cancelled by Chrysler shortly after their takeover of AMC. ^ Legally registered on 6 July 1955. ^ a b c Smith, Roy (2008). Alpine and Renault: The Development of the Revolutionary Turbo F1 Car 1968 to 1979. Veloce Publishing. pp. 18–23. ISBN 1-84584-177-8. ^ a b c d e "Bilan 31-12-2016 de la Société des Automobiles Alpine ou SAA ("Alpine")" (in French). Societes.com. Retrieved 6 October 2017. ^ "Alpine". Societes.com. Retrieved 25 February 2017. ^ "CONSTRUCTORS: ALPINE (AUTOMOBILES ALPINES)". Grandprix.com. Archived from the original on 16 May 2012. Retrieved 16 May 2012. ^ "Automobilia". Toutes les voitures françaises 1962 (salon Paris oct 1961). Histoire & collections. Nr. 19: Page 9. 1200. ^ "Renault Concept – A710 " Berlinette 2 " : l'Alpine sacrifiée". Renaultconcepts.online.fr. Retrieved 22 May 2012. ^ Ireson, Nelson (15 June 2008). "New details on Renault's revival of the Alpine sports car". Motorauthority.com. Retrieved 22 May 2012. ^ "Report: Renault scraps plans for Alpine revival". Motorauthority.com. 25 February 2009. Retrieved 22 May 2012. ^ "Renault Alpine A110-50 Exclusive Photographs". thecarwallpapers.com. theCARwallpapers.com. Retrieved 17 October 2012. ^ "The Return Of The Renault Alpine". Jalopnik.com. Retrieved 22 May 2012. ^ "Renault and Caterham to Build Affordable Racecars". reuters.com. reuters.com. Retrieved 5 November 2012. ^ a b Madslien, Jorn (5 November 2012). "Caterham Cars and Renault link up to build sportscars". BBC News. BBC. Retrieved 21 February 2013. ^ a b "Caterham Cars and Renault link up to build sportscars". Caterham F1. 5 November 2012. Archived from the original on 10 February 2013. Retrieved 24 February 2013. ^ Rendell, Julian (5 November 2012). "Renault, Caterham to produce new Alpine sports car". Autocar.co.uk. Retrieved 24 February 2013. ^ "Renault has acquired Caterham Group's stake in Société des Automobiles Alpine Caterham". media.renault.com. Renault. 10 June 2014. Retrieved 10 June 2014. ^ Tisshaw, Mark (16 February 2016). "Alpine Vision concept unveiled". Autocar.co.uk. Retrieved 2 March 2016. ^ News, Auto World (2017-01-19). "Renault: Alpine Sports Car With An Aluminum Chassis And Flawless Agility". Auto World News. Retrieved 2017-02-08. ^ "European glory for Alpine". media.renault.com. Renault. 29 September 2013. Retrieved 10 June 2014. ^ "In addition to defending the ELMS title it secured in 2013, Alpine has set its sights higher for this year's Le Mans 24 Hours". media.renault.com. Renault. 19 March 2014. Retrieved 10 June 2014. ^ "Carros do Passado – Interlagos, o primeiro carro esporte nacional". www.bestcars.com.br. Retrieved 16 March 2009. ^ "Bulgaralpine". Motor Car History. Retrieved 9 February 2019. ^ "Renault-Alpine". How Stuff Works. Retrieved 23 June 2014.